According to Hindu scriptures, Garuda is a bird (Kite or Eagle) and the mount of god Vishnu. Garuda looks similar to eagle having head and wings and sometimes with the rest of his body like that of a man. Additionally, he is also associated with Sun and Fire. Garuda is called by various names as- Chirada, Kamayusha, Nagantaka, Suparna, Sushahara, and by different other names. 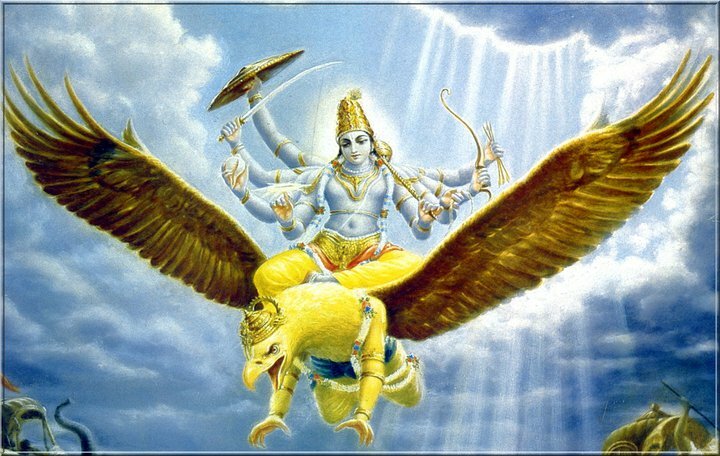 Garuda was the son of Kashyapa and Vinita and is also known as the King of Birds. Garuda represents birth and heaven and is the enemy of all snakes. This ancient deity is said to be massive and large enough to block out the sun. Also, it is quite popular to use the image of Garuda as an Amulet to protect from snake attacks and their poison, since the king of birds is the worst enemy of serpents (snakes). 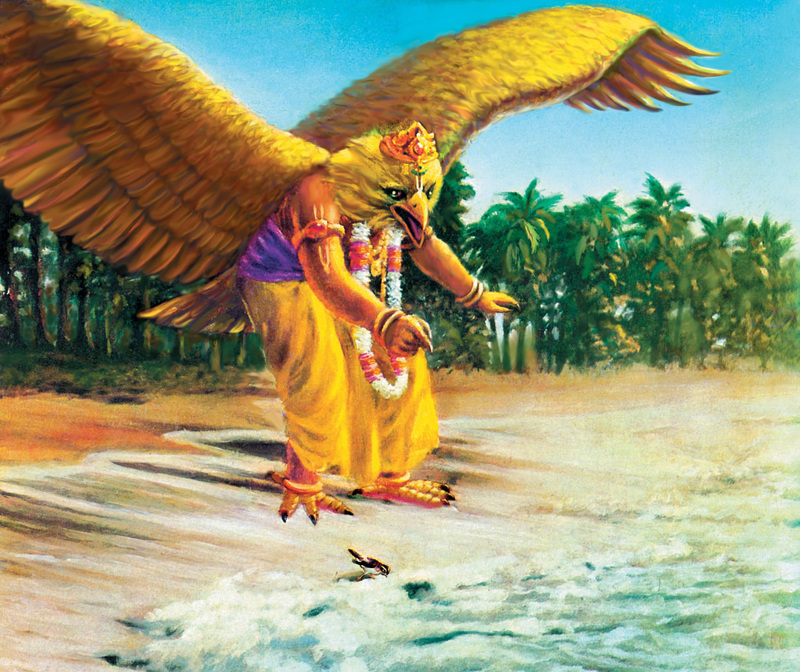 The story of Garuda’s birth is told in the first book of the great epic Mahabharata. According to the epic, the father of Garuda was Rishi Kashyapa. He had two wives, Vinita and Kadru, who were the daughters of Prajapati Daksha. In spite of being sisters, they always used to quarrel with each other. Kashyapa once asked his wives to grant them their wishes. Kadru wished for a thousand snakes as her sons whereas Vinita wished for only 2 sons who must be laborious and much strong, more than the 1000 sons of Kadru. Later, both of them laid eggs. After some time, a thousand eggs of Kadru hatched into snakes, but the two eggs of Vinita did not hatch for a long period of time. Being worried and impatient, Vinita broke one egg which was half formed with an upper part only as a human and thus he was deformed. Her deformed son cursed her because of her action and also said that she would be the slave of her own sister for a long time until her second son will be born who would save her from his curse. By saying those words her first son flew away and later on, he became the charioteer of the sun. After waiting for a long period of time the second egg hatched which was fully grown, shiny, and mighty in size who emerged as the Garuda. Hence, according to the legends, this is how Garuda was born. 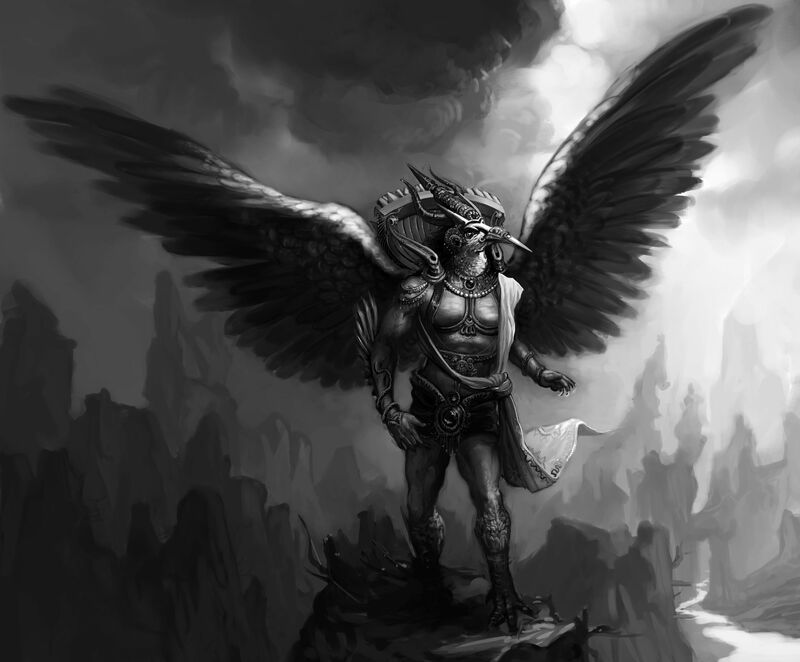 Legend has it that Garuda is a bird-like creature that has a mix of an eagle and human features. Traditionally, Garuda has the torso and the arms of a man and the wings, head, beak, and talons of an eagle or vulture. His body is in golden color, having red wings, and a white face. Similarly, Garuda appears in the form of the enemy for all snakes which is a symbol of death and underworld. It is also believed that this ancient deity was massive, enormous in size and large enough to block out the sun. Lord Garuda has an important position in Hindu religion, Buddhism as well as in various other religions. Similarly, the Garuda Vyuha is worshipped in Tantra during several Abhichara Kriyas (Black Magic) to protect one against Abhichara (Negative Energies). Garuda is the Sankarashana energy of the Lord, who is believed to have manifested into the nature of lord, during the process of creation. Lord Garuda having a very important place also in Buddhism. It is believed that the lord was appointed by Sakra to protect Mount Sumeru and Trayastrimsa heaven from the attack of Asuras. Similarly, Garuda also signifies a veritable cultural symbol in Asia. Garuda is the national Emblem of Indonesia and the national airline of Indonesia is named after him as well. In India, the figure of Garuda is used as a military symbol which specializes in carrying out operations behind the enemy lines. Likewise, in Thailand, the Khrut (Garuda) is its national symbol which literally means “Garuda, the vehicle”.Thus, God Garuda is followed all around the world especially in Southeast Asia. Being such a powerful deity, it was most likely to have sculpture or image of Lord Garuda in many temples. There is a beautifully crafted image of Garuda in front of the Changu Narayan Temple in Kathmandu. Similarly, there is a large and a beautiful stone image of Garuda placed in Hanuman Dhoka Temple situated in Kathmandu, Nepal. There is an ancient Kal Garuda Temple which is also known as “Nachiar Kouil” which is located in Thrivunaraiyur place of Chennai, Tamil Nadu, India. Similarly, Prambanan temple is a 19th-century Hindu temple compounded in central Java, Indonesia dedicated to Garuda. Likewise, there are many more temples, statues, handcrafts of god Garuda all around the world. It is also believed that reading Garuda Purana helps one to get rid of misdeed and a person becomes good and well satisfied and also the fact that the man who reads Garuda Purana attains supreme destination as having obtained all of his desires.